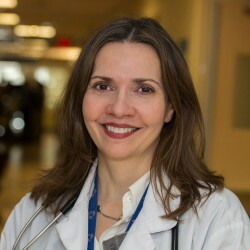 Dr. Margaret S. Herridge is Professor of Medicine, Critical Care and Pulmonary Medicine at the University Health Network; Senior Scientist in the Toronto General Research Institute; Director of Research for the Interdepartmental Division of Critical Care Medicine, University of Toronto. She obtained her MD from Queen’s University at Kingston, completed her clinical training in Respiratory and Critical Care Medicine at the University of Toronto and obtained her MPH at the Harvard School of Public Health. Since 1997, her group has completed 3 cohort studies: 5-year outcomes in survivors of ARDS (co-PI Angela Cheung); 1-year outcomes in survivors of SARS (co-PI Catherine Tansey PhD); 2-year outcomes in patients after 7 days of mechanical ventilation and their family caregivers (co-PI RECOVER Program Phase I- Jill Cameron PhD). Dr. Herridge is currently Director of the RECOVER Clinical and Research Program for patient-and family-centred follow-up care after critical illness, conducted in collaboration with the Canadian Critical Care Trials group (CCCTG). Dr. Herridge has authored or co-authored over 150 manuscripts and book chapters on topics related to outcomes after critical illness in patients and family caregivers and is the co-editor of the textbook of post-ICU medicine with co-editors Drs. Stevens and Hart. She has published 2 editorials and 3 manuscripts in the New England Journal of Medicine on outcomes after ARDS and family caregivers after prolonged mechanical ventilation and is a frequent international speaker on outcomes after critical illness. Herridge MS, Cheung AM, Tansey CM, Matte-Martyn A, Diaz-Granados N, Al-Saidi F, Cooper AB, Guest CB, Mazer CD, Mehta S, Stewart TE, Barr A, Cook D and Slutsky AS. One-year outcomes in survivors of the acute respiratory distress syndrome. N Engl J Med. 2003 Feb 20. 2003 Feb 20; 348(8):683-93. Herridge MS, Tansey CM, Matte A, Tomlinson G, Diaz-Granados N, Cooper A, Guest CB, Mazer CD, Mehta S, Stewart TE, Kudlow P, Cook D, Slutsky AS and Cheung AM. Functional disability 5 years after acute respiratory distress syndrome. N Engl J Med. 2011 Apr 7. 2011 Apr 7; 364(14):1293-304. Cameron JI, Chu LM, Matte A, Tomlinson G, Chan L, Thomas C, Friedrich JO, Mehta S, Lamontagne F, Levasseur M, Ferguson ND, Adhikari NK, Rudkowski JC, Meggison H, Skrobik Y, Flannery J, Bayley M, Batt J, dos Santos C, Abbey SE, Tan A, Lo V, Mathur S, Parotto M, Morris D, Flockhart L, Fan E, Lee CM, Wilcox ME, Ayas N, Choong K, Fowler R, Scales DC, Sinuff T, Cuthbertson BH, Rose L, Robles P, Burns S, Cypel M, Singer L, Chaparro C, Chow CW, Keshavjee S, Brochard L, Hébert P, Slutsky AS, Marshall JC, Cook D, Herridge MS; RECOVER Program Investigators (Phase 1: towards RECOVER). ; Canadian Critical Care Trials Group. One-Year Outcomes in Caregivers of Critically Ill Patients. N Engl J Med. 2016 May 12;374(19):1831-41. Herridge MS, Chu LM, Matte A, Tomlinson G, Chan L, Thomas C, Friedrich JO, Mehta S, Lamontagne F, Levasseur M, Ferguson ND, Adhikari NK, Rudkowski JC, Meggison H, Skrobik Y, Flannery J, Bayley M, Batt J, Santos CD, Abbey SE, Tan A, Lo V, Mathur S, Parotto M, Morris D, Flockhart L, Fan E, Lee CM, Wilcox ME, Ayas N, Choong K, Fowler R, Scales DC, Sinuff T, Cuthbertson BH, Rose L, Robles P, Burns S, Cypel M, Singer L, Chaparro C, Chow CW, Keshavjee S, Brochard L, Hebert P, Slutsky AS, Marshall JC, Cook D, Cameron JI; RECOVER Program Investigators (Phase 1: towards RECOVER). ; Canadian Critical Care Trials Group. The RECOVER Program: Disability Risk Groups and 1-Year Outcome after 7 or More Days of Mechanical Ventilation. Am J Respir Crit Care Med. 2016 Oct 1;194(7):831-844.